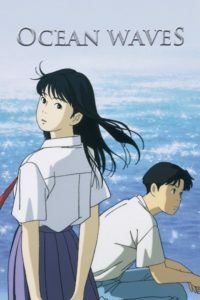 Ocean Waves was the only Studio Ghibli movie that I hadn’t seen – it was made for television and didn’t involve any of the big Ghibli names, but still. We were going to watch it a few months ago, but realized that it was being released in Blu-Ray in the U.S. soon, so we decided to wait for it. Taku Morisaki is on his way back to his hometown of Kōchi for his high-school reunion. On the flight, he reminisces about his high school days, and in particular, his friendship with Yutaka Matsuno and Rikako Muto (who he thought he glimpsed at the train station earlier). Most of the story is told via flashback, although there is some present-day story as well (similar to Only Yesterday). The movie is well-made and tells a heartwarming story. I’d read various reviews saying that this movie wasn’t as good as the other Ghibli movies, but I think it’s still pretty darn good. The animation style is a little different, and it doesn’t fit Miyazaki or Takahata’s styles exactly (this was the first Ghibli movie not directed by one of them), but it has a little bit of Miyazaki’s warmth and Takahata’s focus on ordinary people. I also really liked the protagonist, he was unusually outspoken and that endeared him to me. Whiskey Tango Foxtrot stars Tina Fey as Kim Baker (based on Kim Barker, who wrote the memoir the movie was adapted from), a rookie journalist sent to Afghanistan in 2003 to cover the war there. At first, she is overwhelmed by culture shock but soon manages to carve a niche for herself. I assumed this movie would be more like War Machine – mostly comedic, but it actually had quite a bit of heart, helped along by the always lovable Martin Freeman. It reminded me a little bit of The Hurt Locker, which also deals with how the weirdness of the War on Terror changes people. Tina Fey is perfect for the role of Baker, awkward and uncomfortable with herself at first, eventually growing into someone formidable. Two kids find a seemingly abandoned police car in the middle of nowhere and decide to take it for a spin. However, the car isn’t actually abandoned, and the local sheriff who owns it (played by Kevin Bacon) is willing to go to any length to get it back. Cop Car is a quiet movie with a small cast of characters, but it packs a lot of punch. It’s got a great atmosphere, set in a bleak, dusty town in the middle of nowhere. It’s well-paced and trusts its audience to a degree that most films don’t – it’s intensely focused on the current situation and lets you fill in all the backstory on your own with only a few hints. The two kids who play the protagonists do a great job, too. I’m not a big sports fan, but watching Ron Shelton’s Bull Durham and Tin Cup made me way more interested in baseball and golf, respectively. So, I was excited to watch this movie about Cesar (Antonio Banderas) and Vince (Woody Harrelson), professional boxers and best friends who are about to face each other in the ring for the first time. The entire movie is set over a single day as the two friends drive to Las Vegas for the match, so it’s both a boxing movie and a roadtrip movie. As I expected, Shelton’s direction makes the boxing far more engrossing that I would’ve expected, grounding it with some great character development ahead of time. However, I wasn’t a huge fan of the character of Grace, the woman who drives Cesar and Vince to Las Vegas, and has dated both of them – she seemed too much like Annie from Bull Durham, but not as good. Nate, a young (and somewhat nerdy) FBI agent, is recruited to go undercover and join a white supremacist group suspected of stealing some radioactive material. This movie isn’t that good but Daniel Radcliffe gives a fantastic performance. I still kind of think of him as either Harry Potter or someone who plays weird/shifty characters (see Now You See Me 2 and The Gamechangers), but he’s really believable as an American FBI agent playing things straight. The movie is somewhat cliched, but I did appreciate its attempts to cause some conflict for Nate by showing that white supremacists are people too, and you can find things to like about them just like everyone else (like sharing a love of classical music). It’s nowhere near as good as American History X, though. After watching the two Despicable Me movies, we had to watch Minions. I expected it to be flashy and fun, but pretty shallow, and that’s exactly what it ended up being. It’s set a few decades before the other movies, when the Minions come out of hiding to try and find a new master to serve. Their first choice is Scarlet Overkill, the first female supervillain, and they are thrilled when she accepts them into their service. But when their first mission goes wrong, she turns out to be a terrible master. Summarizing this movie isn’t easy, when I think back to the plot, it doesn’t really make any sense – it’s definitely a movie made just for kids and not both kids and adults. But it’s entertaining enough while you’re watching it, so I guess that’s good. Chloe Grace Moretz stars in this movie about a teenage girl trying to find her younger brother after a catastrophic alien invasion. The 5th Wave is a solid entry into the teen post-apocalyptic movie genre (e.g. Divergent, The Maze Runner, The Hunger Games) and it’s not very good, but my husband and I both love the melodramatic teen drama genre for whatever reason, so we enjoyed watching it. It has all the hallmarks of the genre: two love interests, one who is brooding and mysterious, and the other who is cute/boy-next-door, teenage soldiers fighting, a surprising lack of adults making decisions, characters needing to use basic survival skills even though there’s advanced technology, and so on.